Please note, however, that there is NO spare parking at Communications House therefore you are advised (if possible) to travel in your car instead of your van as the multi-storey car park has a height restriction on it. 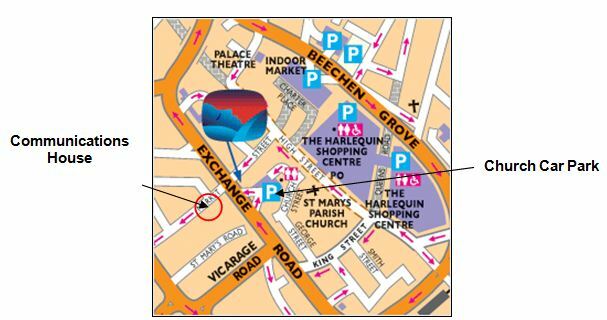 When you come around the ring road (called Exchange Road), look out for the Church multi-storey car park on the right-hand side - it's right next to the Travel Lodge just before some traffic lights. When you park there, cross the road at the traffic lights and carry on walking down Market Street - a very pretty flint-covered church will be on your right-hand side. The entrance to Communications House can be found through an archway directly opposite Mangans pub and our building is the pristine cream one on the right hand side.